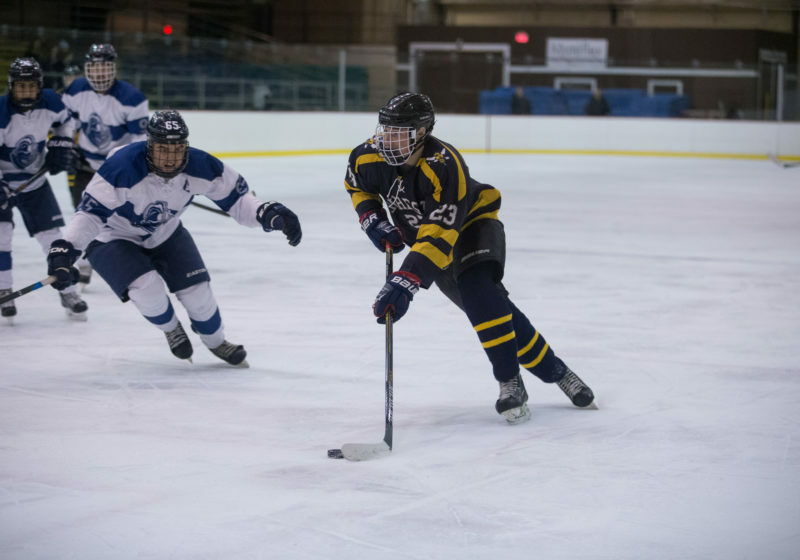 Coming off two wins at home in November, the UR Club Hockey team faced the SUNY Geneseo Knights and the Hobart Statesmen this weekend, picking up two close losses in a series of hard-fought, gritty games. On Friday evening at home, Geneseo scored early in the game, with UR tying the game minutes later. After an up-ice rush by senior forward Mike Finestone the ‘Jackets earned their second goal of the game. Two more goals from the Knights and one from the Yellowjackets ended the first period with a tied score, 3–3. Each team found the net once in the second period, with senior captain and forward Ian Gabalski tying the game yet again, while tension and physicality gradually increased. In a similar fashion, in the 14th minute of the third period, Geneseo scored, only to be met yet again by UR, tying the game at 5–5 minutes later. A penalty call left the ‘Jackets one man short, and the Knights took advantage of the power play with eight minutes remaining in the game, making the score 6–5. A series of saved shots from senior defenseman Joe Malone looked to tie the game in its final minutes, but it proved not enough. On Saturday, the ‘Jackets made the trip to Geneva, home of Hobart College, whose record consists of a win and a loss on the season. Both teams went scoreless in the first period. UR scored twice and Hobart three times in the second. “I do not think we communicated as effectively as we normally do on the ice, especially in the defensive zone, which led to some breakdowns in coverage in front of the net which they were able to capitalize on,” junior defender Nick Hoffman said. Senior forward Tom Rossini scored UR’s only goal in the third period, and Hobart would eventually add two more to their tally, ending the game with a final score of 5–3. At the end of the weekend, a bright spot for the Yellowjackets lay in the overall season performance from UR’s senior Ben Abbatematteo. He continues to lead the league in points, with seven goals and seven assists for a total of 14 points in seven games. UR will continue their season into the new year and play on Jan. 21, when they take on at St. John Fisher, who has two wins on the season.